The Strong Spirit Path: What Do My Latest Readings Indicate About My New Venture? What Do My Latest Readings Indicate About My New Venture? I recently pulled cards from my Earth Magic Oracle Deck, and, I also happened upon another FREE online Tarot Reading. My intention for both was what I may need to know about successfully launching Nature's Art & Soul, and generating the needed resources to move. We had decided to set a goal of having a minimum of $2k monthly ~ generated from online sales of the store, &/or my services offered by phone, or any source above and beyond our clinic income ~ as a base line that would help us to more comfortably move. Rather than try to arbitrarily choose a month to just go, no matter what, this plan made sense, and gave us a goal to shoot for. There is a lot to learn when setting up a store ~ or any business or website for that matter. I am still working to get my other online sources ~ my Strong Spirit Woman website, my two blogs (this one and The HyperCarnivore), and my YT channel built up, so hey, why not add more to that by creating a store? Am I crazy? Yes! Do I have those nagging self doubts creeping in? Of course. What assurances or indications can I glean from my latest two readings about taking on this new venture? Do the reading Gods support this, or are they cautioning me to reconsider? 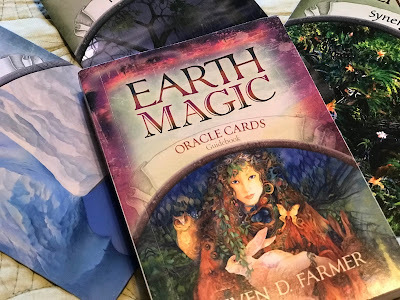 First up, the Earth Magic Oracle Deck. I shuffled and spread out the cards, quickly picking the first, then also grabbing the next two that popped out at me. After pulling, but before looking, I also had the sense to separately pull the four cards that would have been off the top of the deck, had I not spread them out. While the main question was answered with the first three cards, the next four seemed to indicate the action 'steps' needed to overcome any obstacles, and generate what we need to move. First card: ICEBERG/Submerged - "Over 90% of an iceberg's body is below the surface, deeply submerged in the bosom of Grandmother Ocean." Whatever you repress or deny and attempt to keep out of conscious awareness will show up somewhere and somehow. These are your shadow aspects....Now is the time to allow these elements to surface and embrace them. These may make up some sort of self expression, a secret dream you wish to accomplish, or even uglier aspects that are difficult to acknowledge or accept. Whatever you have submerged deep inside of you, this is your opportunity to pay attention to those things, and welcome them into the family called "you." Since my sound healing session, I still have had flashes of my past come into my conscious awareness, much of which occurred during some of my darker years. The timing of pulling this card made a lot of sense. Unearthing any subconscious blocks or old and tired belief systems has been an ongoing project, much of which is now thankfully behind me. But, there is always more, isn't there? It could also indicate some aspects of my self-expression which I hold back, largely because of the potential consequences that I know exist in our current state of affairs. The main goal being to remain as aligned with my own personal truth, integrity, and authenticity as possible underlies all that I do. The theme of being potentially persecuted for unpopular opinions also lurks beneath the surface, like that iceberg. Second Card: RAIN/Purification - Interesting to pull two forms of water. Frozen and floating on the oceans, and flowing from the skies. We certainly miss being near the water, and with some recent developments with family health, moving to Michigan seems the most logical choice. The wintery Michigan hills and ski 'mountains' could certainly be likened to an iceberg compared to being here in the desert! "No matter whether it's a light shower or a deluge, rain cleanses and purifies." Purifying your mind, body, and spirit is the task that is put before you. Purify your mind by identifying a prominent belief you carry about yourself that inhibits you from being fully engaged in life, from showing up 100 percent of the time. Purify your heart by allowing yourself to breathe in and out blessings and forgiveness so that you can love even more deeply. Let yourself feel your grief...so that the rivers of your tears become miniature baptisms that heal the wounds in your soul. Third Card: GREEN MAN/Synergy - "Green man is Earth's vegetation personified." When doing three card spreads, the first can represent the immediate past, or the main issue. The second is the present, or the recommended action. The third is the potential outcome. There is also a synergy between your spiritual awareness and your personal self, or ego. Be aware of the various idiosyncrasies of your ego, and do not take them too seriously. Know that your Higher Self is always looking out for your best interests. In this cycle, tune in to that guidance, however it shows up, and you will find that you move through Life with greater ease due to a synergistic balance of forces expressing themselves as you. I seriously can't convey emphatically enough just how much I have prayed for this. Greater ease and flow. Operating from an inner knowing that feels Divinely aligned in all ways. And living a life with much greater ease. I know there has been some lingering issues to tend to, residual influences from earlier life challenges and traumatic events. I truly have worked hard to change my life from the inside out. I feel on the brink of an entirely new phase, one I always dreamed of and could at times barely imagine ever realizing. It's upon me, and yet, it's not written in stone. It all depends on me, my thoughts and actions. The free online tarot reading was also very encouraging, and spot on. I'm really on a roll with these readings! You can shuffle the cards, then when ready, they are spread out. You click on the six you want, each representing a different aspect, as seen below. There are only major arcana cards used. The more clear and specific your question is, and the more focused you are, the better the results. In other words, don't be vague, but do ask what you need to know about an issue, not just a 'yes' / 'no' question. Here were the results. This site also has four different decks to choose from when doing your reading. If you sign up, you can have your reading saved, and probably get some other perks too. This spread also made perfect sense. My fears and what is going against me (Cards 3 & 5) seem to reflect my concerns and ongoing frustrations with various news events and issues that are happening, here and abroad. I also have minor frustrations with technology, not having internet at our office, etc. I know that when it comes down to the wire, we will have some choice to make, including letting go of our clients, local friends, furnishings, and various aspects of our life here ~ including our clinic! Plus, most people prefer to move somewhere warmer as they age, versus much colder. As much as I have an inner strong urgent desire to relocate, there is plenty I enjoy about our area, and will miss. In a way, The Hanged Man is the quintessential marker for a major life transition. Each one of these cards also have numbers that are significant based on my birthday and name numerology as well. When I added them all up, they equal 72. 7 + 2 = 9. I believe we will be ready to move within 9 months at the latest, possibly by the end of the 9th month, September. 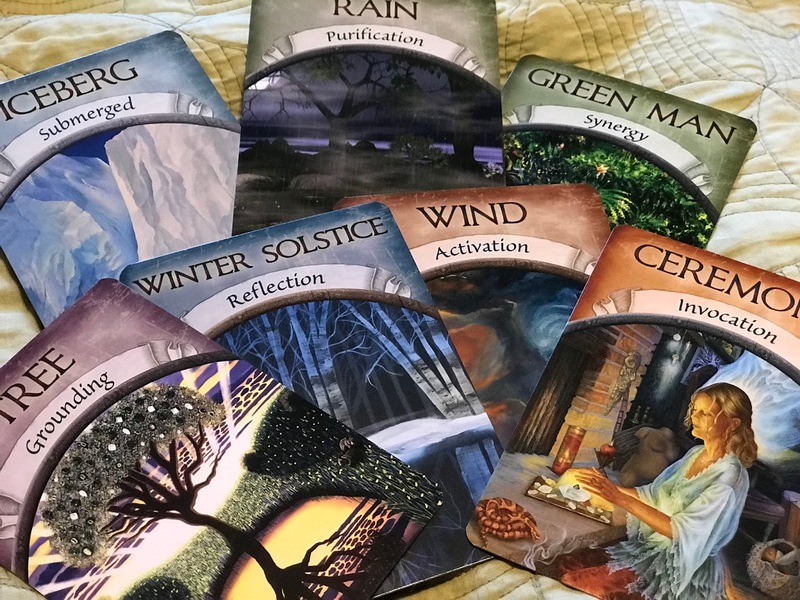 These four cards, TREE for grounding; CEREMONY for invocation; WINTER SOLSTICE, for reflection; and WIND for activation seem to be indicating the steps to bringing the outcome into fruition. Grounding will keep us earth bound, in our body and able to re-spond. It is the best way (for me at least) to release anxiety and unwanted thoughts as well. Holding a ceremony, praying for vision, and invoking the Universal, Divine Powers, Nature Spirits, Animal Guides++ can help really strengthen the energy of our or one's desires. Remaining mindful and reflective will help us to be alerted to our intuition, and adjusting accordingly. For us, it could also indicate that we will be manifesting our next home by the winter solstice, celebrating the Yule/ Christmas holiday in a more wintery area that actually has winter celebration events! And finally, wind for activating all of our desires into reality, just like we used to blow upon a dandelion tuft, once upon a time ~ before smart phones and computers and we all played outside!